Maybe I should thank the pollen for delaying this post. LASplash has created a major stir with their Smitten Lip Tint Mousse, so much so that they keep popping in and out of stock. The last time I sat down to try to write this post, both Nagini and Sirius were both temporarily gone. They're back! I'll admit that I panicked a little the first time they went out of stock, which lead to me pouncing on them the moment they came back. I've been known to go a little crazy over their lipcolors before. There was no way I could risk not having these two beauties in my life! Note- The color of my skin in the closeup photos is a bit weird. My elderly camera got a headache and turned me all kinds of colors. I opted to keep the product color as true as I could, even if it meant that the green swatches make me look pink and the blue makes me yellow. Sorry about that. 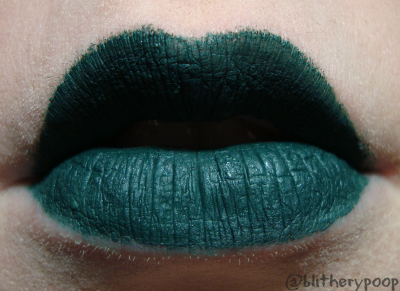 Nagini is deep emerald green. AAAAAHHHH!! I think I have a new favorite lip color! Nagini is everything I wanted Envy to be. It is matte as matte can be. The color is flat-out phenomenal. I'm not just impressed, I'm astounded. It gets better... It wears well too! I left it on for much longer than I usually would for swatching, probably half an hour or more. 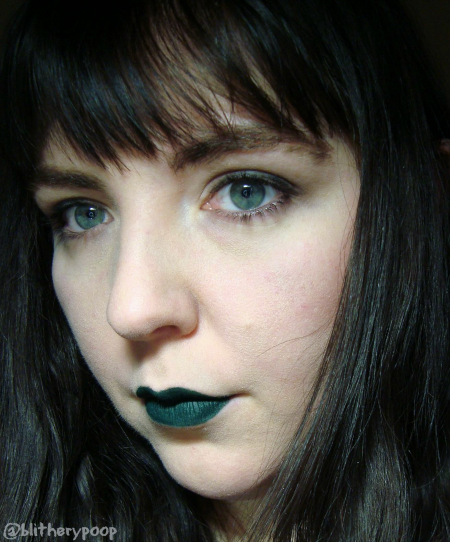 I talked to The Beard, I licked my lips (bad habit I've never kicked), I gushed to McGee about how much I love this color....and it stayed put so much better than I'd ever have expected! See that pink part showing through? 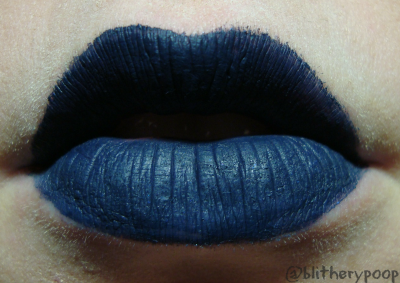 Nothing, and I mean nothing, I've ever tried can get lip color to stick there, but Nagini clung on way better than most. I wasn't going anywhere that day, but I felt like it needed a real test, so I went and bugged The Beard again, closer up this time. 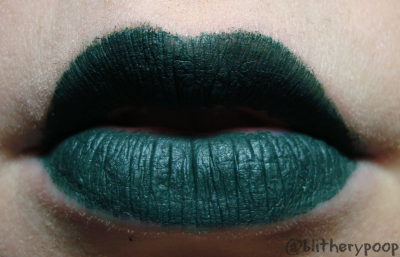 Kissing is the ruin of so many lip products, so how'd Nagini do? That is after kissing! After! I don't mean a little peck on the cheek, I mean actual kissing. There was some flaking. You can see a tiny speck of it under my lower lip. Flakes of green wound up on him too, but they brushed off without making a mess. 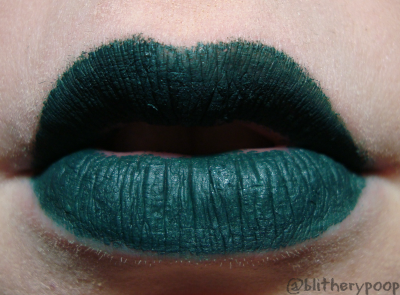 Intense colors tend to be fussy and need touchups, so I am elated by how well Nagini passed the kiss test! I can't pretend there aren't any drawbacks to the formula and packaging. This stuff isn't the easiest to apply and I think my upper lip came out a little crooked. Their strong chemical smell could be a problem for some people. It also settles into every crease and crinkle. The feel while it's on is dry dry dry, but it doesn't seem to be terribly drying once it's off. The removal needs a mention too. The flip-side of the great wear is that it's tougher to remove than most. I'll be reviewing their special remover when I review my Lip Couture picks, but I'll tell you now...it's not the only way to remove it. Anything greasy will do. A thick coat of balm and a little bit of rubbing works just as well as the remover. The usual question for colors like this is "will you actually wear it?" Damn right I will! I kept my eyes subtle this time. The shadow is a palette from H&M, maybe the brown one? I might do this exact thing again the next time I get dolled up. 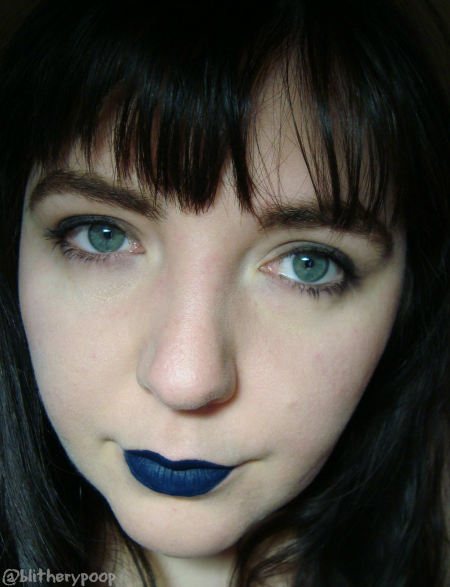 Maybe I have a new second favorite lip color too. If Nagini is an improved version of Envy, Sirius is kinda a better version of Greed. Kinda. It's darker, and navy instead of royal. The formula is the same as Nagini, but I didn't wear it for as long or do a kiss test. Both of these make my eye color glow and I love them even more for that. Bottom line: I adore both of these! Mind-blowing color and great wear earn them all the points in my book. They do feel dry and strange while they're on, but they're not particularly drying once they're off. The strong chemical smell fades quickly and they don't really need the special remover. I'd call them completely worth the $12 price tag, which is monumental praise from a cheapskate like me. if you're waffling at all on them, do it. You'll love them. 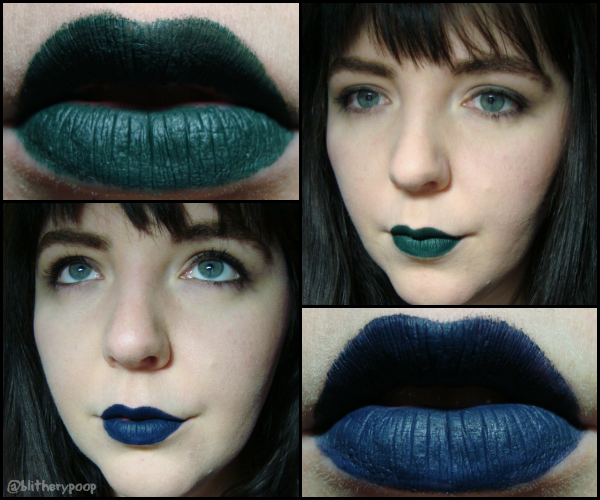 Have you gotten these or any of LASplash's other recent liquid lipcolors? Do you love them as much as I do? Oh man, I love those both! Sirius is so gorgons, I may need to pick it up. Both color really do bring out your eyes. Lovely. Wow... they really do make your eyes pop! Gorgeous!! !